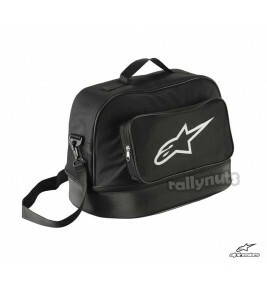 Alpinestars Flow helmet bag, constructed from a lightweight polyester upper with a hard wearing rubberised base. Internally a soft fleece lining protects the helmet from scratches and knocks. The built-in mesh panel inserts provide ventilation allowing moisture to disipate, keeping your helmet fresher between races. Handles and a detatchable shoulder strap make carrying easy.